House GOP members claim sequestration victory. 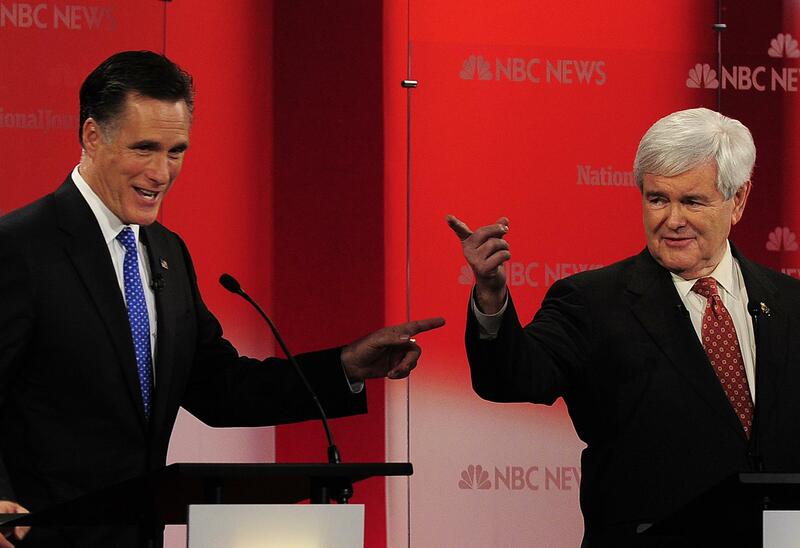 Mitt Romney and Newt Gingrich take part in the Republican presidential debate at the University of South Florida in Tampa, Florida on January 23, 2012. The Heritage Foundation gathers House conservatives once a month for an open-press, open-blogger panel called “Conversations with Conservatives.” Every month, the tone has grown both more militant and more optimistic. An example: Two members referred to the agreements made among all Republicans at their retreat in Williamsburg, Virginia as the “Williamsburg Accord.” That accord “keeps the sequester cuts” while sequencing a debt debate that Republicans can live with. “We can take our deals, principles, and vision,” said Kansas Rep. Tim Huelskamp, “and put it into the debt ceiling debate this summer.” Huelskamp, who’d lost his budget committee slot (then pitched a fit about it) after opposing Paul Ryan’s 2012 plan, said he’d vote for this one. “You’re going to see a bright shiny object attached to this debt ceiling vote,” predicted the glummer Rep. Tom Massie, a freshman from Kentucky. He didn’t think the conservatives’ goals, like the defunding of Obamacare, would survive. But why be so pessimistic? The conservatives argued that they’d taken the worst the president and the press had to offer during the sequestration fight. They’d won. They would win again. There was a funny tension here: The party leadership was following their lead, but that leadership was discussed in the terms usually reserved for a rival military power. An accord! A blogger tried to sow a little discord by asking the conservatives what they thought of the RNC’s minty fresh reform plan. They were fine with the restrictions on media, less on board with the outreach and apology stuff. “Making sure we don’t have George Stephanopoulos do our Republican debates is probably good,” said Labrador. But the panel’s discussion of immigration took for granted that the party needed to change and win more Latino votes. More on that in a bit. Correction, March 20, 2013: This post originally misspelled George Stephanopoulos’ last name.